Hill profile: Some hills, with altitude. This is not a tour for the faint of heart! See below for the exact breakdown of miles and elevation per day. The trip cost will be $5,400/ team ($2,700 per person). 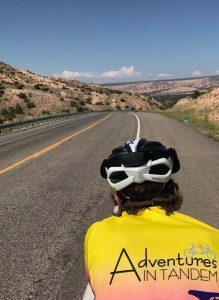 Discover the unique combination of Spanish, Mexican, Native American and Anglo cultures as we pedal through the breathtaking landscape of the American Southwest. We begin our eight night adventure in the artsy town of Santa Fe, where we will take a short ride through the downtown area with its art galleries, shops and restaurants and enjoy dinner together. 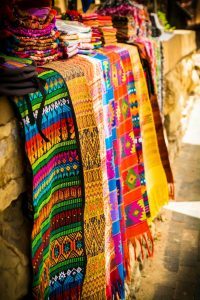 From Santa Fe, we will visit the town of Chimayó, formed in 1680, visit the historic El Santuario de Chimayó, browse the weaving shops, and experience their world famous chili powder. We will have dinner at the renowned Rancho de Chimayó Restaurante where we will taste New Mexican cuisine at its finest. From Chimayó we will ride on to historic Taos. On our way to Taos, we will stop at a weaving shop and meet a seventh generation weaver. We will also stop at a Bronze Foundry. Our ride into Taos will be over the “High Road into Taos”. It is both strenuous riding and beautiful. 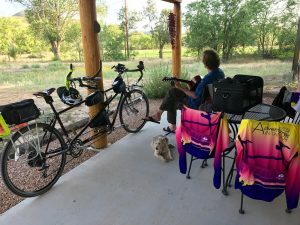 We will have a lunch break at the Sugar Nymphs Cafe in the small town of Peñasco before we ride a few more hills and then descend into Taos. We will spend two nights in Taos. In Taos you can tour the Taos Pueblo, a living Native American community and World Heritage UNESCO site and National Historic Landmark with over 1000 years of history. Our hotel is a short walk to the square where there are shops, art galleries and restaurants. You will have the opportunity to ride the Enchanted Circle — an 87 mile by-way that loops through incredible scenery around Mount Wheeler. Shorter rides will also be offered for the day in Taos. From Taos, we will ride across the Rio Grande Gorge Bridge, the fifth highest bridge in the US. 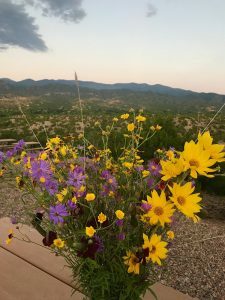 We will tour the funky Earthship Community of off-the-grid sustainable homes, have a picnic lunch by the Rio Grande Gorge bridge and head over to the town of Ojo Caliente. Ojo Caliente is known for its ancient hot mineral springs. Bring a bathing suit because we will be visiting the springs in the afternoon and will test out the healing powers of lithia, iron, soda and – believe it or not – arsenic! We will have dinner at the Taos Trail Inn where they will be opening their restaurant just for our group. After leaving Ojo Caliente, we will stop at David Michael Kennedy’s photography gallery in the small town of El Rito where you can see photographs of musicians, artists and actors as well as pictures of the grand New Mexican landscapes and people. 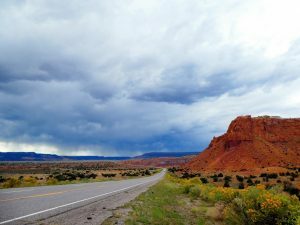 Then you get back on the tandems and ride through the iconic landscapes to Abiquiu — legendary artist Georgia O’Keeffe territory. See the beauty that inspired her paintings. 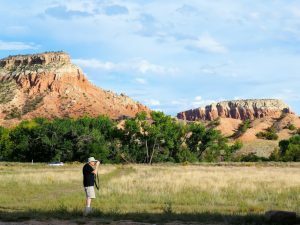 We will tour the Ghost Ranch, have a sunset toast and dine together at the Abiquiu Inn. 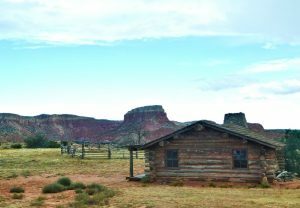 We will spend a second night in Abiquiu giving us the opportunity to hike around the beautiful and iconic landscape. You may also have the opportunity to take the Georgia O’Keeffe tour of her studio. We will end the day with a second group dinner at the Abiquiu Inn. From Abiquiu we will ride back to Santa Fe where we will spend our last night. History buffs won’t want to miss a visit to nearby (by car, at least) Los Alamos and the Bradbury Science Museum where you can explore the history of the Atomic Bomb. In Santa Fe, we will also offer rides on the quieter side of town around beautiful open countryside as well as where the one percent live. We will finish our tour with a group dinner in Santa Fe. We will be capping this tour at 8 teams. The cost is $5,400 per team ($2,700/person). Register here. Expect some hills – this area of the country is beautiful, but it isn’t flat! Note that this tour is at altitudes of 7000 to 8000 feet above sea levels. This will make the ride feel even more strenuous. 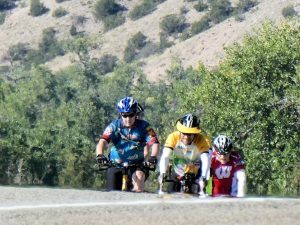 While we do not regularly provide SAG support on our tours, due to the longer distances, hills and altitude, we will be able to provide SAG support – particularly on Days 3 and 8. *We offer some short SAGs on these days to get you through the worst part of the hills. Note that we do not provide any bicycles. We expect that you have a tandem that is in good working order and that you are able to assemble your bike. If you do not have your own tandem, you can rent a coupled tandem from Mel at Tandems East or Mark at Tandem Diversity. 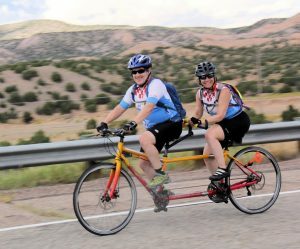 If you have a tandem that is not coupled, we recommend that you ship your tandem to Santa Fe before the tour. BikeFlights is an option.